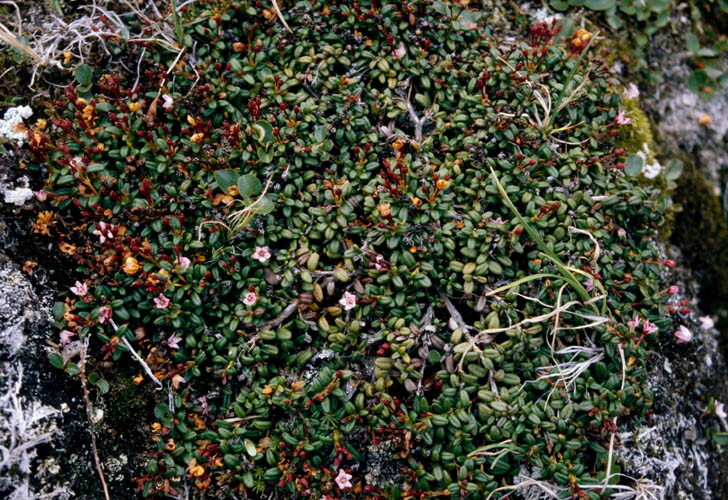 Flora of the Canadian Arctic Archipelago - Loiseleuria procumbens (L.) Desv. Published in J. Bot. Agric., sr. 2, 1: 35. 1813. Type: Sweden, selected by Chamberlain, in Jarvis et al., Regnum Veget. 127: 22. 1993. Lectotype: LAPP 90. Synonymy. 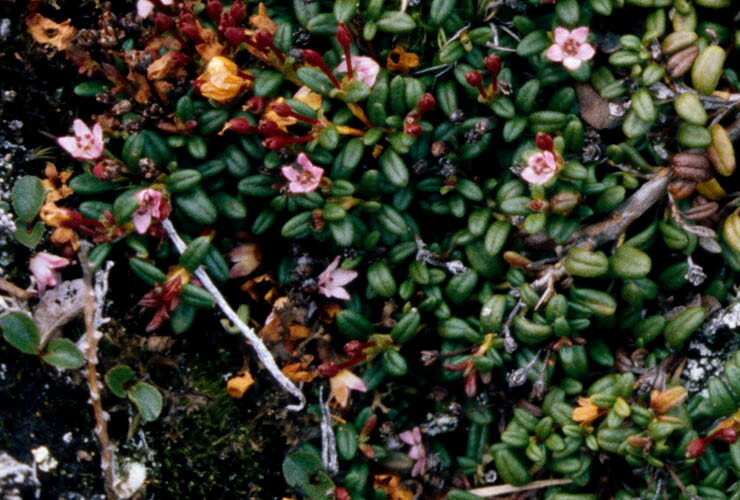 Azalea procumbens L., Sp. Pl. 151. 1753. Vegetative morphology. 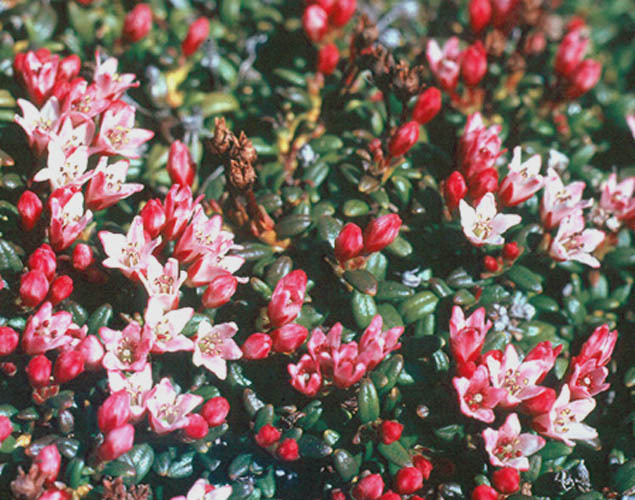 Plants 5–10 cm high; shrubs; dwarf shrubs, or low shrubs. Horizontal stems at ground level, branching extensively to shape plant habit as mats. Aerial stems prostrate. Leaves present; distributed along the stems; alternate; persistent and marcescent. Petioles present; 1–2.5 mm long (often flattened against the stem and easily overlooked); glabrous (abaxial surface), or hairy (adaxial surface); pubescent (if applicable). Petiole hairs appressed, or spreading (conspicuous as tufts in the axils of new leaves); curved. Leaf blade bases truncate, or rounded. Blades 4–8 mm long, 1–2.5 mm wide, oblong or elliptic, involute, veins pinnate (with midvein impressed into the adaxial surface) or appearing single-veined. Blade adaxial surface without sessile glands, glabrous (with a thick epidermis). Blade abaxial surface hairy, hairs tomentose, hairs very dense, hairs white, hairs curved, hairs appressed or spreading. Blade margins entire; apices rounded. Reproductive morphology. Flowering stems two or more per plant. Flowers solitary, or in inflorescences. Inflorescences fasciculate (with few flowers); lateral. Pedicels present. Flowers per inflorescence 2–3(–4); small. Sepals conventional; 5; fused (at the base); 2–2.5 mm wide; red (burgundy). Calyx rotate; 5-lobed; with sessile glands; glabrous. Petals conventional; fused; 5; white, or pink; 6–9 mm long. Corolla rotate; 5-lobed. Stamens 5. Anthers reddish, becoming yellow. Anthers opening with a terminal pore. Anthers 0.4–0.6 mm long (without horns). Nectaries present (in a ring around the base of the ovary). Ovary superior; carpels 3–5; syncarpous. Ovaries oblong; glabrous. Styles 1. Placentation axile. Fruit stalked; stalk 5–10 mm long; with calyx persisting; dry; a capsule; ovoid; black, or brown; 3.5–4 mm long; 2.5–3 mm wide; glabrous; surface appearing veinless; not distinctly flattened; dehiscent; opening with teeth at the top of the capsule; teeth 5. Seeds 0.4–0.6 mm long; brown, or yellowish; surfaces smooth. Chromosome information. 2n = 24. 2n = 24. Hagerup (1928); Löve and Löve (1956, Iceland; 1966b, northeastern USA; 1982a, Arctic Canada); Zhukova and Tikhonova (1971, Chukotka); Zhukova (1980, southern Chukotka). A few more southern counts. Ecology and habitat. Substrates: tundra, slopes, dry meadows; dry; rocks, gravel, till; with low organic content; acidic. Occasional to common in dry stony heath on acid; dry bouldery slopes in Precambriam bedrock and till; growing in dry gravel patches on rocky slopes with Arctous (CAN 541759). North American distribution. Alaska, Yukon, continental Northwest Territories, Nunavut Islands, continental Nunavut, northern Quebec, Labrador. Range in the Canadian Arctic Archipelago limited. Low Arctic, alpine. Arctic islands: Baffin. Northern hemisphere distribution. Circumpolar, or circumboreal (arctic-alpine). Northern Iceland, Northern Fennoscandian, KaninPechora, Polar Ural  Novaya Zemlya, YamalGydan, West Chukotka, South Chukotka, East Chukotka, West Alaska, North Alaska  Yukon, Central Canada, Labrador  Hudson Bay, West Greenland, East Greenland. General notes. This is a well-accepted taxon. Illustrations. • Plants in dry habitat. 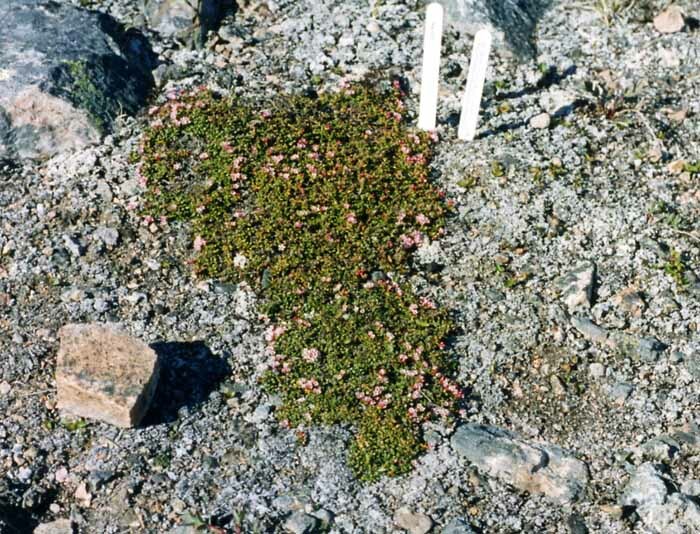 Plants to the left of the markers growing on dry relatively barren tundra. Nunavut, Baffin Island, Ogac Lake. 8 July, 2004. Aiken and LeBlanc 04–022. CAN 586495. • Close-up of plants. 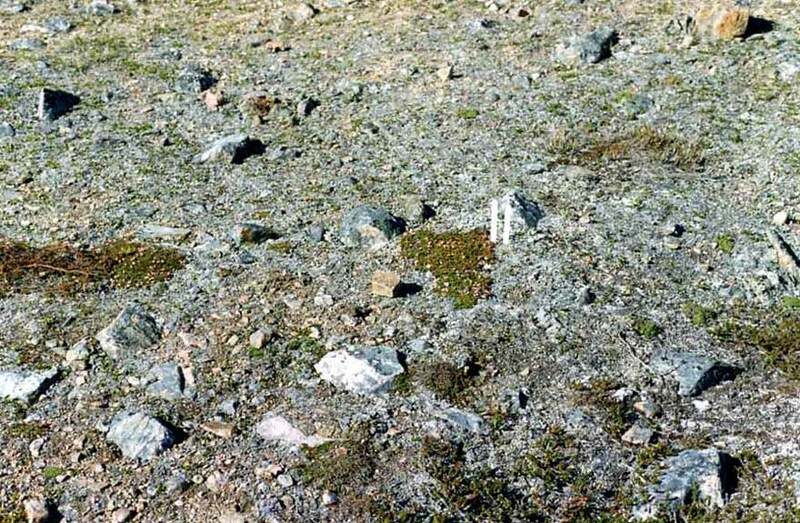 Plants to the left of the markers growing on dry relatively barren tundra. Nunavut, Baffin Island, Ogac Lake. 8 July, 2004. Aiken and LeBlanc 04–022. CAN 586495. • Close-up of plant mat. Plants with simple oblong or ovate leaves and small pink flowers. Aiken and LeBlanc 04–022. CAN 586495. 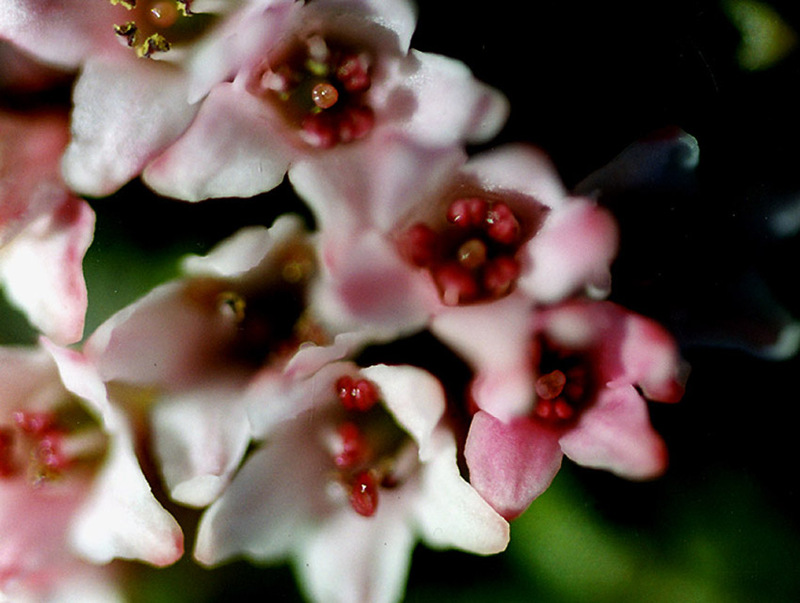 • Close-up of flowers. 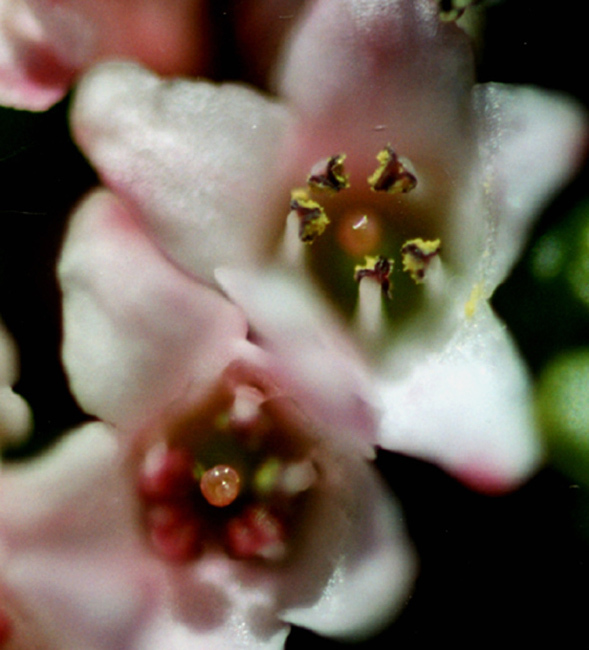 Flowers with fused petals five pre-anthesis anthers and a developing stigma. Aiken and LeBlanc 04–022. CAN 586495. • Close-up of two flowers. Upper flower has five anthers that have split to release pollen, lower flower has developing plate-shaped stigma. Aiken and LeBlanc 04–022. CAN 586495. • Close-up of plant. 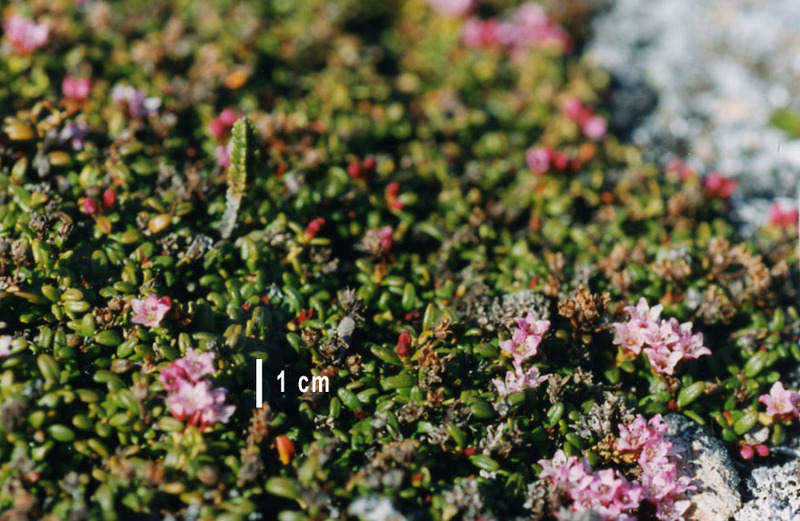 Close-up of cushion of Loiseleuria with flowers about 7 mm in diameter and growing in dense tundra over rocks. Nunavut, Baffin Island, Frobisher Bay, Ogac Lake. 16 August, 1999. L.L. Consaul 2362a, L.J. Gillespie, and R.J. Soreng. • Close-up of plant. Flowers about 7 mm in diameter with 5 pink, fused petals and 5 red pre-anthesis stamens in a single whorl that alternate with the petals. There are reddish developing capsules and the leathery leaves have a single prominent vein sunk into the adaxial surface. Nunavut, Baffin Island, Frobisher Bay, Ogac Lake. 16 August, 1999. L.L. Consaul 2362a, L.J. Gillespie, and R.J. Soreng. • Close-up of flower. Flowers with 5 pink, fused petals and 5 red pre-anthesis stamens in a single whorl that alternate with the petals. The leathery leaves have a single prominent vein sunk into the adaxial surface. Nunavut, Baffin Island, Ogac Lake. 1962. Photographed by Ian Mclaren. 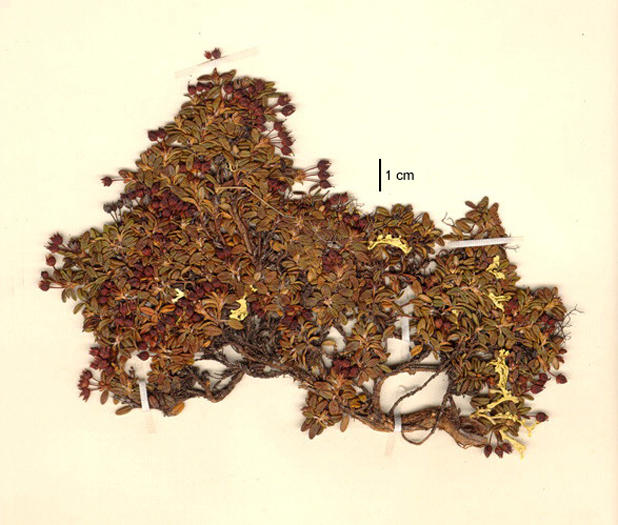 • Herbarium specimen. Semi-prostrate shrub less than 15 cm high with a well-developed and much-branched stem. The numerous developing capsules are borne in clusters of 2–3(-4) flowers. Nunavut, Baffin Island, Koudkjuak River. 5 July, 1931. J.D. Soper 125757. CAN 88047. • Arctic Island Distribution.